Suitcase or Backpack? This is one dilemma that disturbs most people when it comes to choosing a medium of carriage. 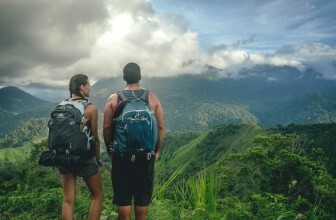 Although it depends on your personal preference, a backpack is more convenient than a suitcase as it’s lighter, versatile, and more user-friendly. When it comes to backpacks, there are multiple brands that are ever ready to introduce you to a whole new experience. One of these brands is Oakley. Founded back in 1975, this brand started off by selling top of the range sunglasses for snowboarding and other outdoor activities. Later on, this brand diversified to include different ranges of products such as shoes and backpacks. Today, this brand is famously known for producing stylish and highly designed backpacks focused on outdoor activities such as hiking, camping, snowboarding, and climbing. 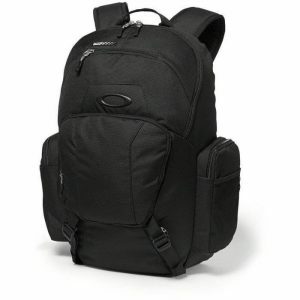 In this guide, we will review four of the best Oakley backpack and at the end; we will offer useful tips on what to look for when choosing an Oakley backpack. The Oakley Men’s Bathroom Sink Backpack has truly come as a solution to busy professionals, college students and hikers alike. Depending on your daily endeavors, this backpack has the capacity to carry all your personal necessities without running out of space. It has an amazing built quality that includes 20% Polyester and 100% Nylon lining. It has a padded back, ventilation marks for breathability, adjustable shoulder straps and a roomy laptop compartment that accommodates 13” devices. The stitching is tight and the fabric is robust and tear resistant giving the bag more years of use. This backpack comes in two exclusive colors to match your personality. It has multiple compartments where you can store all your personal accessories. This bag has heavy padding on the back and shoulder straps to enhance comfort. The double stitching and use of heavy-duty fabrics makes this backpack durable and ever-ready to handle any hiking tasks. Adjustable shoulder straps allow for even weight distribution. According to some customers, the price of this backpack is too high. A fraction of other customers complain that this bag is quite complex to use. All in all, this backpack is one hell of a product you can’t miss to purchase for all your outdoor activities. Its rugged design is appealing to the eyes while the heavy-duty construction means that this bag can handle any outdoor assignment. The zippers slide like butter while the external metal rings offer you the freedom to attach various add-ons such as ropes during climbing and hiking. Are you a nomadic surfer looking for a convenient bag that will match all your hiking demands? Well, the Oakley Men’s Blade Wet Dry 30 Backpack is exactly what you need. There are many reasons why this backpack has bossed of being the best. First, this backpack is tailored from a combination of heavy-duty materials that include 100% Polyester and 100% Polyester lining. The bag has a spacious interior that accommodates devices up to 15” alongside other personal stuff such as fins, wax, and sunglasses. This bag has zipper closures, a height of 21” and 16.5” shoulder drop meaning it holds up well to your back when hiking, surfing, and exploring. This bag has a capacity of 30L making it roomy enough to accommodate most of your personal accessories. The fabric is salt-water resistant and dries out fast to prevent moisture. The bag comes in a choice of four colors to choose from. The straps and the back part of this bag are heavily padded for added comfort when surfing and hiking. This backpack comes with a wet and dry insert. According to some customers, this bag doesn’t come with a dedicated dry bag. Sometimes the package might arrive in a different color which was not your choice. Overall, this backpack is one of the best to consider if you’re a hiking connoisseur or a nomadic surfer. It comes with eye-popping features such as a large interior and features multiple compartments that accommodate most of your essential gear. This bag has a quick drying fabric and is salt-water resistant making it durable than most bags in its price range. 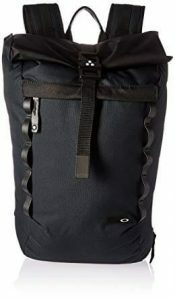 Next, in our review, we have the Oakley Mens Voyage 23L Roll Top Backpack. 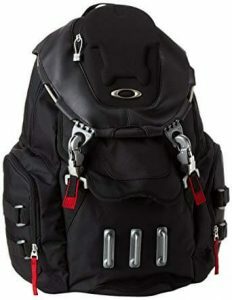 Also a member of the Oakley family, this backpack prides itself for having a unique roll-top opening design that increases the interior capacity to allow the bag to accommodate more accessories. Made of 50% Polyester and 50% Cotton, this backpack is breathable and very comfortable. Although it has a minimalistic design, this bag is roomy enough to accommodate a 15” laptop. This bag is machine washable and is available in three distinctive colors that include; Blackout, California Blue, and Dark Brush. The roll-top opening design gives this bag a minimalistic appearance yet it’s large enough to fit all your accessories. This backpack comes with both a zipper and buckle closures to secure all your personal stuff. The adjustable shoulder straps and the ergonomic EVA back panel provide immense ventilation and boost the overall comfort of this backpack. The bag comes in a choice of three colors to choose from. This bag doesn’t have multiple storage compartments where you can store most of your small valuables. Some customers complain that the stitching is quite poor. In conclusion, the Oakley Mens Voyage is a compact minimalistic backpack that fits snugly round your body to give you an easy hiking, surfing and commuting experience. Tailored from a mix of cotton and polyester, this bag is durable and comfortable enough to suit in a wide range of daily endeavors. Finally, in our humble review, we have the Oakley Men’s Enduro 20L Backpack. Whether commuting to the office, attending classes or skating around the neighborhood, this backpack will prove to be helpful as its light and compact enough to prevent any weight inconveniences. Tailored with a double-zippered design, this bag has separate roomy compartments that provide you with enough space to fit most of your personal assets such as; 15” devices, eye-gears, snacks, and lotion among others. Last but not least, this bag has reflective elements at the back and on the shoulder straps to make you visible in low light. This bag comes in a plethora of seven inspiring colors to choose from. It has multiple interior compartments where you can keep all your personal valuables. The dual zippered closures lock the interior entirely to prevent any possible loss of your valuable items. The reflective elements make you visible in low light. This backpack is too sporty to be used for professional duties such as offices. If you’re a college student, a hiking or sporting enthusiast, then this is the perfect backpack to consider for all your daily endeavors. It has a roomy interior, double stitching for added reinforcement, multiple colors to choose from and best of all; it has reflective elements that make you visible at night. What Makes The Oakley Brand Popular? Having kicked off their operations in Southern California in the 1970s, Oakley gained prominence for their outstanding performance in the optical segment where they were recognized for producing high-end sunglasses, goggles and other demanding sporting equipment. 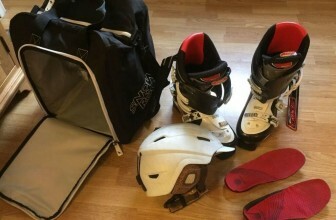 Following on the success of their outstanding well renowned eyewear line, Oakley went ahead to venture in other functional categories especially in the fashion arena where they produced some of the best military gear, laptop bags, suitcases, mountain biking, and backpacks to suit a wide range of customers and athletics demands. Today, Oakley is a well-established brand and a leader in the sporting business. The brand has won over 500 patents and over 1,000 trademarks making it a global icon in the entire fashion space. 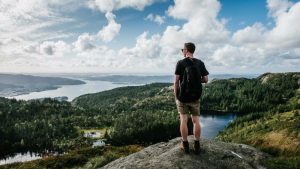 When choosing the best Oakley backpack, there are those factors you need to think of before making your final statement. 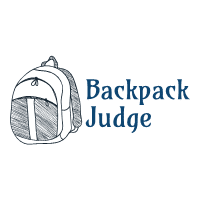 Although backpacks may appear similar in shape and sizes, there are some silent factors that remain hidden and are only pronounced when its time to put the bag to a real test. So, to avoid any frustrations, here are some key pointers you need to look at when buying an Oakley backpack. This is the first key pointer you must consider when looking for a backpack. Depending on your preference, you can either choose a small bag or a large one ranging from 30-50L, 40-70L to a 70L+ backpack. With this in mind, you’ll avoid buying a small bag which will barely fit all your valuables or a large one that will expose you to unnecessary weight. 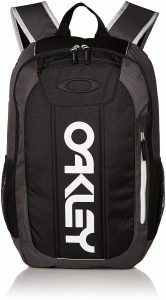 Most Oakley backpacks are designed for outdoor use. Therefore, to protect your personal stuff from getting wet incase of a drizzle, you need to look for a bag made of water-resistant material. 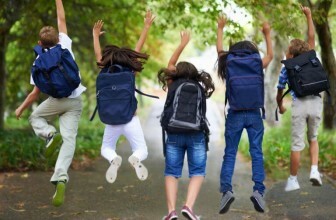 Now, depending on the model, some backpacks may come with semi-waterproof materials or tarps which you can use to cover your bag in case of a heavy downpour. Still, on the material, make sure the fabric you choose is able to self-dry fast enough to prevent your bag from getting musty. This factor goes hand in hand with how you wish to use your backpack. If the bag is meant for light use, then choosing one with few compartments will be the perfect move. On the other hand, if the bag is meant for demanding duties, then choosing one with multiple compartments will definitely be the best option. The best thing about multiple compartments is that they let you spread out your belongings into smaller sections for easy access while in the wild. So, if it’s accessing your laptop, your flip-flops, lotion, cellphone or wallet, everything will be available to you anytime you need them. This pointer is highly paramount especially when it comes to your overall comfort. To allow even weight distribution, make sure the bag you choose has thick padding on the hip belt, shoulder strap and back area. This will at least help to reduce pressure points and massive straining on the hips, shoulders and lower back as this is where most of the weight lies. This is one of the silent pointers which most people forget to look at. A warranty is really helpful as it gets you covered in case of a defect. To stay on the safer side, make sure that you look at the warranty to see what it covers and for how long. One good thing here is that big brands such as Oakley offer great warranties to keep their customers happy. Lockable zippers: you see, these double zippers are recommended as they help you to lock each compartment to prevent loss of precious accessories (such as your laptop, tablet, ornaments etc) through theft. Side pockets: these are made of stretching materials and are perfect for storing water bottles. Additional pockets: especially in the shoulder straps and the hip belt provide ample space for fitting your Smartphone, iPod or audio devices for an exclusive music experience. From what we’ve seen, it’s evident that Oakley backpacks are perfectly tailored to meet the demands of both professionals and average users. These bags are well stitched and are extremely versatile making them usable in a wide range of settings. Whether it’s surfing, schooling, commuting or biking, there’s always an option that’s ever-ready to meet all your demands. 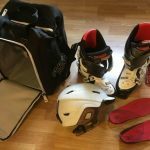 Although there are lots of new backpack brands available in the market, the Oakley brand has truly made a name for itself as it’s among the best brands that promise customers quality products that are able to endure the test of time.